Will the baby wrap be long enough for me? The baby wrap is long enough for the average Mommy up to a size 40. Kindly contact us for an extra length Baby Wrap should you feel it is necessary. What if the Baby wrap is too long for me? Simple take a scissor and cut it to your preferred length. Why is the Baby Wrap not sewn around or does not have a hem? Because of the ultra-stretchable fabric used the hems do not fray and curl in automatically once you start using your Wrap. To put a thread in a piece of material that is pulled and stretched around your body so often will make the thread come out and fray very ugly. How do I wash my baby wrap? Your Tulips & Tea Baby Wrap Carrier is knitted from a durable cotton mixture. This is a blended material, but the largest percentage is Cotton. Cotton washes easily in any washing machine with cold water and soap. Cotton is known to shrink easily, therefore it is advised to hang out to dry and not tumble dry. Cotton can be ironed, but as it is stretched over and around your body, it is not necessary. Do not iron over the leather label. Do not iron over stains, as it will make it permanent. Up to what age can I use my Tulips & Tea Baby Wrap Carrier? 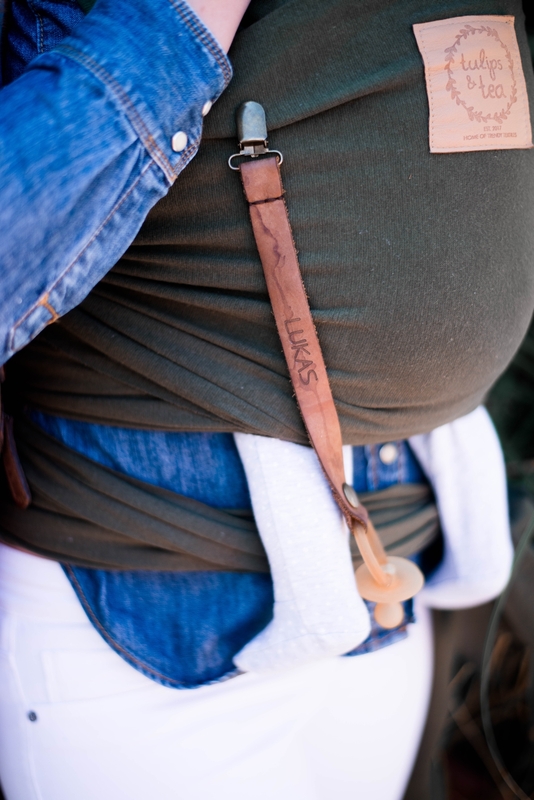 As it is a stretchy wrap you can use it as long as it securely holds your baby against your body. It is advised that you rather use it from new born to 10kg. Although there are clients using it up to 12kg, but it is not advised. What is so special about Tulips & Tea’s fabric? The fabric choice is ultimately your own personal preference, but this textile mixture works for us and our clients. The fabric your Tulips & Tea Wrap is made from is knitted and not weaved. It isn’t t-shirting or ordinary cotton like some baby wraps on the market. The fabric used is a 240mg Cotton Rib with a small percentage Lycra and spandex to ensure just enough stretch, without your baby wrap losing its shape, ensuring long lasting durability. 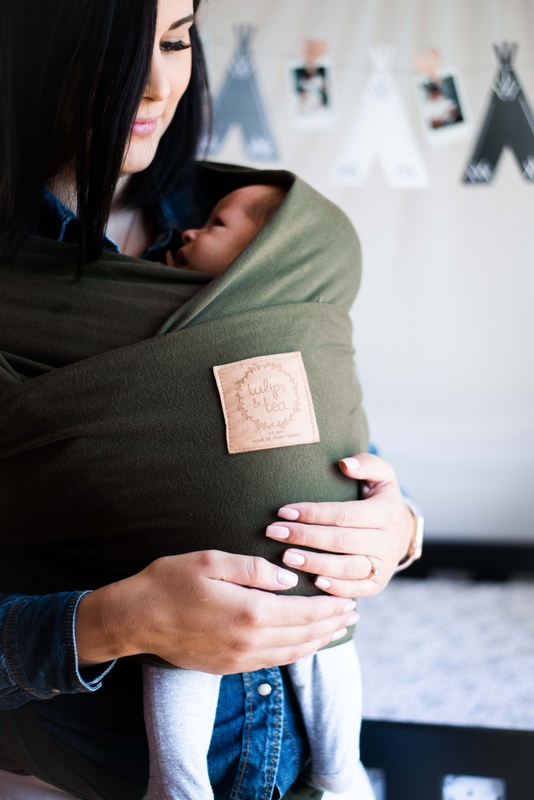 You will feel the quality when you pick up your Baby Wrap, the fabric is thick and heavy to safely secure your baby against your baby. The fabric used will not wear out as you go about your daily actives whilst wearing your baby. Because of the thread count your baby will stay in the same place you tied it. Can I use it for twins? Yes, you can carry both your twins at once. Each in a sling over each breast. They will unfortunately grow out of the baby wrap very fast. It is advised to rather carry them individually. Will the Wrap be too hot in the summer? Although the cotton fabric is breathable, it will most probably be a bit warmer to wear on summer days, just like any other clothing item. Can Tulips & Tea leather dummy clips be personalised? Absolutely, Yes. For an additional R25 we can custom make a dummy clip for you. This price includes up to 13 engraved characters. Should you have a request for a longer word, please speak to us on tulipsandtea.orders@gmail.com, as anything is possible, and we would love to assist you. What can the Tulips & Tea dummy clips be used for? The Tulips & Tea dummy clip is very versatile. Most dummies (NUK, Tommee Tippee, Snookums, Honey, Tobbie & Co, Phillips Avent, etc.) will clip on easily. Most teethers or even a small toy can also be clipped on. Some parents even use the personalised leather band to ‘name’ their little one’s bag for play school! Why is the Tulips & Tea dummy clip so popular? The Tulips & Tea personalised leather dummy clip is a very special gift for a baby shower or even a christening. Moms love it because it is so versatile. Most dummies or teethers and small toys clip on easily. The best part is that the timeless leather design, makes the clip look stylish and durable. It’s made from natural genuine leather to last you a life time! Furthermore it will ensure that the dummy or teether stays clean and safe, within the reach of your little one. Local delivery in and around Cape Town @ R50, includes: Gordon’s Bay, Strand, Somerset West, Stellenbosch, Northen- and Southern Suburbs of Cape Town, all the way to Melkbosstrand and not further inland than Joostenberg Vlakte. Choose nation wide door-to-door delivery @ R100. Visit Pargo (https://pargo.co.za/find-a-store/) to choose a convenient pick up point, nation wide @ R65. How do I clean my leather dummy clip? / And is a 'leather dummy clip practical' ? The more you use it the ‘better’ it gets. Leather ‘wears in’, instead of out. You can wipe of with a damp cloth / wet wipe, or even put it in the washing machine! (It has been machine washed twice before your purchase.) The dummy clip just gets more character, that’s the amazing thing about genuine leather! I want to become a reseller or stockist! We are fortunate to appear in many different types of shops, from baby boutiques, gift shops, leather stores and even farm stalls! You can even become an online reseller from the ease of your own home. Please email us at tulipsandtea.orders@gmail.com!